Be a good listener. Actively listen and become engaged in the client’s or customer’s project or problem. By listening attentively, you will be better equipped to identify and anticipate the client’s or customer’s needs. Oftentimes, the client’s needs are more emotional than logical. In the legal profession, as well as other industries and professions, a practical solution, rather than a legal or technical one, may more appropriately address the client’s or customer’s needs. Under-promise and over-deliver. Give the client/customer more than what that client/customer expects. Provide a reasonable estimate of the time it will take to complete a project and then deliver before the deadline. This is akin to “doing what you say you will do.” Keep your promises and do what it takes to deliver the services promised, by or before the deadline promised, no matter what it takes. For example, if our firm says it will draft and deliver a document by Monday, we make sure that happens, even if it means working over the weekend or late into the evening. Reliability is key to delivering outstanding service and maintaining a strong client/customer relationship. Accessibility. Be accessible. Return phone calls and reply to emails the same day as receipt. Sometimes you may not have availability to discuss the client’s or customer’s problem at length. However, oftentimes the most important point for the client or customer is not that they have their problem addressed immediately, but for their problem to be acknowledged by you. At a minimum, call back or send an email and schedule a time to talk in more detail. Stay in regular contact with the client/customer. Continually update the client or customer regarding the project for which you were engaged. Clients/customers are busy as well and do not have time to continually follow up. Make a conscious effort to keep the client/customer informed. Sometimes it’s enough to simply say there is no update. The client/customer wants to know their project has not been swept aside for some other matter. With today’s prolific use of electronic messaging, there is no excuse for a client/customer to be “out of touch”. Explain what happens next and when. Help the client/customer understand the process and the timing for the project, not only as to the completion date, but also next steps. Clients/customers should understand key project milestones and when you expect those milestones to be attained. Despite the numerous deadlines involved with particular matters, clients/customers may perceive that not much is happening between those deadlines. Help them understand what is going on behind the scenes. Every business’s most important asset is its clients/customers. 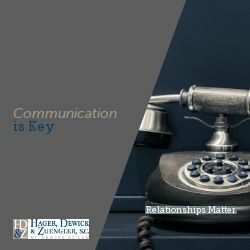 When a client or customer is properly communicated with and knows what to expect, that client/customer usually is a very satisfied client/customer. When you are able to satisfy or exceed your client’s/customer’s expectations, that client/customer not only will continue to do business with you, but will inevitably refer others, and your business will reap the benefits of the efforts you took to provide superior client/customer service. 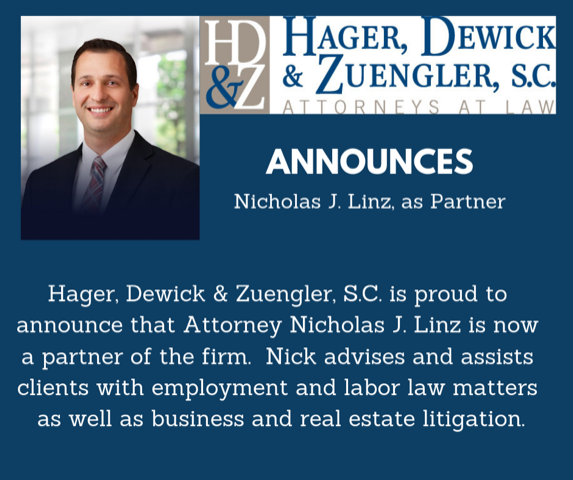 David P. Dewick is a business and transactional attorney with Hager, Dewick & Zuengler, S.C.